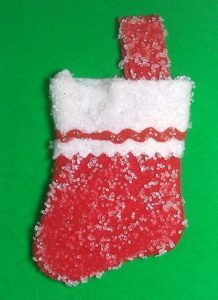 Soak a holiday stocking in crystal solution to make a glittery crystal decoration or ornament. Grow crystals on a holiday stocking to make a glittering crystallized decoration or ornament. If you don’t have borax, other crystal salts will work, including table salt. The crystals will look different. Use enough very hot water to be able to soak the stocking. Stir borax into the water until no more will dissolve. Soak the stocking in the borax crystal solution. Set the stocking on a glass plate or other smooth surface to allow it to dry. You’ll get large sparkling crystals on the side of the stocking facing the plate. The other side will have smaller glittery crystals. Hang the stocking as a decoration or ornament. The stocking can be wrapped in paper and used year after year. You can grow crystals on any porous or rough material, such as cloth or straw, so feel free to adapt this project for other purposes.